MISSION: ALLERGY Premium Microfiber Fabric is the ultimate allergen-barrier: totally effective, silky soft, and imperceptible beneath the sheets. It is extremely tightly woven, with a mean pore size of 2 microns to block all allergens, yet is air-permeable, making it completely comfortable to sleep on. It is not hot and sweaty, as are encasing fabrics made with membranes; does not allow any allergen escape, as do many cotton encasings; and does not accumulate surface allergen, as do encasings made with terry cloth or non-woven fabric. MISSION: ALLERGY Allergen-Proof Mattress Encasings are manufactured with the highest quality sewing construction. All seams and edges are bound for durability. 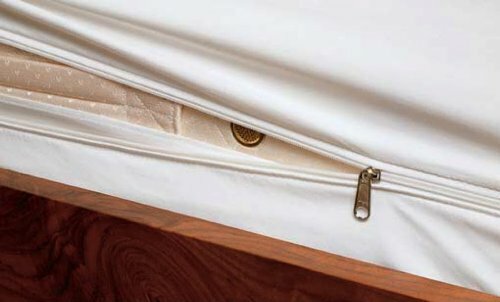 Placement of encasings on the mattress is easier, thanks to super-long zippers that are half the circumference of the entire mattress! Zippers are of the highest quality, with an interior zipper flap to prevent allergen escape through the zipper webbing (no tape needed). These medical-grade encasings are suitable for adults or children with allergic asthma, rhinitis, or eczema (or simply for good hygiene). They are the ultimate allergen-proof mattress encasing for comfort, protection, and durability. 100% Woven Polyester Microfiber. Lifetime warranty. "... protect both your pillows and your mattress with special mite-proof covers, experts say. Be sure you get covers from a reputable company, like Mission Allergy..." THE NEW YORK TIMES "Much Ado About Dust Mites" "Say sayonara to dust mites. The fix is to use hypoallergenic encasements on my mattress and pillows. Dr. Fost recommends Mission: Allergy." HEALTH MAGAZINE "How healthy is your bedroom?" "...The first step in your mite-control mission: the right pillow and mattress covers. Skip the cheapie versions-their weave isn't tight enough. Instead, invest in Mission: Allergy Premium Microfiber Allergen-Proof Encasings." MEN'S HEALTH MAGAZINE "Clearing the Air on Allergies"
Highest quality sewing construction: bound seams, interior zipper flap, and extra-long zipper for easy placement. Lifetime warranty. MADE IN USA. Pacific Coast White Goose Down Comforter 650 Fill Power, Certified Allergy Free and 500 Count 100% Cotton, FULL / QUEEN 90"x 98"
EASTSURE Bulky Knit Throw Chunky Sofa Blanket Hand-made Super Large Pet Bed Chair Mat Rug Grey 40"x79"